Vino Villa is a Wine Bar and Bistro Inspired Restaurant located in a beautifully renovated historic home in Greenwood Indiana. 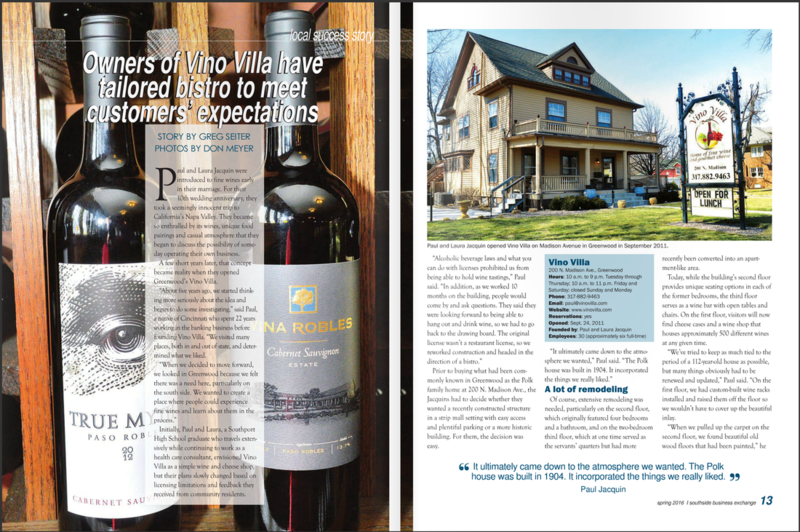 The concept for Vino Villa was born out of a love for wine, food, family and friends. Owners, Paul and Laura Jacquin, strive each day to offer their guests a unique, comfortable dining experience, providing the perfect ambiance for an intimate night out with a loved one, or celebration with a group of friends. Vino Villa offers from scratch and chef driven menu options ranging from small plates and sharable appetizers to pizzas, hearty entrees and delectable desserts. We offer our customers an exquisite selection of wines from around the world. Our diverse selection of wines both by the glass or bottle, will satisfy every wine lover’s palate and wallet. Assisting our customers in selecting the perfect wine for a meal, party, wedding, gift or any occasion is our joy and highest priority. Our historic facility and beautiful patio provide the perfect venue for a bevy of activities and events both public and private. Vino Villa hosts social activities open to the public, such as live music, wine tastings, educational classes and pairing dinners. We also offer the perfect setting for your next private event; birthday, anniversary and holiday parties, off-site business meeting, bridal and baby showers, rehearsal dinners and weddings. ~ Great Food, Welcoming People, Memorable Experiences…This is our commitment.